iOS 10のミュージックアプリでは「シャッフル」や「リピート」ボタンを見つけるのが困難になり話題に。 | AAPL Ch. 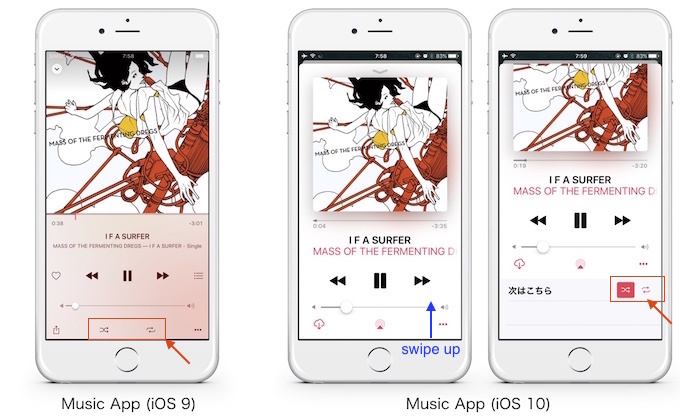 Lots of people have been asking where the Shuffle or Repeat buttons are in the iOS 10 Music app. And it’s true, they’re not easy to find. […]Next, swipe up on the play screen (without pressing the pause, next, or previous buttons), and you’ll see the Up Next queue.